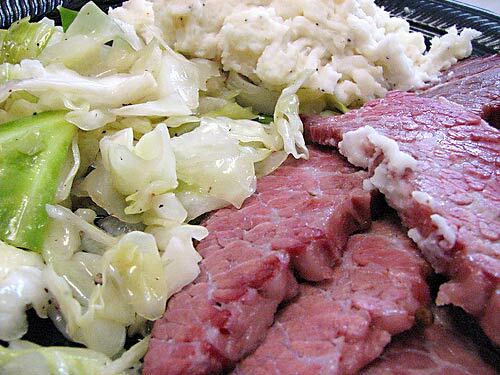 Silverside, or corned beef, is one of my favourite meats. It's cheap, but more importantly easy to cook and can be used in so many different ways. It freezes well too so take the opportunity to stock up when it's on sale. My highest price is $5.49/kg, I won't pay more than that. I like to buy it at $4.99/kg or less and have been known to buy up to 20 pieces to put in the freezer for family dinners (thank goodness for the slush fund). It's also a year-round meat. In summer I sit the slowcooker on the verandah and let it simmer all day, keeping the heat out of the kitchen. In winter it sits on the sink and the wonderful aroma wafts through the house, tantalising taste buds as everyone walks through the front door at the end of the day. We love it cooked and served with garlic cabbage, creamy mash, carrot straws and delicious homemade mustard sauce. Or thinly sliced with a salad. Or shredded and put into spicy mustard pancakes. Or in a pie. Or like this, with a rather elegant sounding Balsamic Plum Glaze. Place the meat, sugar, vinegar, mint, onion, carrot, water and peppercorns into the slowcooker crock. Cover and cook on Low 10-12 hours or High 6-7 hours. To make the plum glaze place the stock, jam, vinegar and sugar into a small, non-stick pan (I use my milk pan). Cook over a medium heat until mixture has reduced to a syrup consistency. Remove the meat, cover with foil and allow to stand for 10 minutes before slicing. Serve meat slices with plum glaze. If you have any corned beef and glaze leftover, use it for either another meal or switch it up and make delicious pan-fried sandwiches with it. Butter two slices thickly cut wholegrain or multi-grain bread. Lay the bread buttered sides together. Spread the top slice of bread with the glaze, add a slice of corned beef and then a thin slice of tasty cheese. Heat a frypan until a little butter sizzles straight away. Add the sandwich, buttered side down. Fry until golden and the cheese is just starting to melt, turn. Fry until the other side is golden brown and the cheese has melted completely. Remove from the frying pan and cut into triangles to serve.